Where did they go? : Intrastate migration, no. 1. Between 1890 and 1900, Mahalia Artis, her adult daughters Sarah and Mary Ella, and Mary Ella’s son Bruce moved 300 miles from Wilson to Asheville, North Carolina. In the 1880 census of Wilson, Wilson County: on Goldsboro Street, Mahala Artis, 50, and daughters Sarah, 25, and Mary R., 18, both laundresses. They are identified as white, which was unlikely. In the 1900 census of Asheville, Buncombe County, North Carolina: at 20R Cumberland Avenue, widow Mahalie Artis, daughters Sarah Artis, 40, and Mary E. Artis, 37, both washerwomen, and grandson Bruce Artis, 10. In the 1910 census of Asheville, Buncombe County: at 18 Cumberland Avenue, Mary E. Lindsey, 37, her son Bruce S. Lindsey, 19, and widowed sister Sarah Battle, 50. Mary and Sarah were laundry women; Bruce did laundry work. In the 1920 census of Asheville, Buncombe County: at 34 Gaston Street, laundresses Sarah Battle and her sister Mary Lindsey, ages listed as unknown. In the 1930 census of Asheville, Buncombe County: laundress Mary Lindsey, 46, living alone in a home she owned. Reddick D. Dew, son of Alfred and Susan Dew, moved to Wilmington, North Carolina, circa the 1890s. In the 1870 census of Wilson township, Wilson County: farm laborer Alford Due, 26; wife Susan, 23; children Jack, 6, Redick, 4, and “no name,” 1 month; plus Oliver Due, 48, Amos Barnes, 23, and Anna Due, 19. In the 1880 census of Wilson township (south of the Plank Road), Wilson County: Alford Dew, 39, wife Louiza, 35, mother Olivia, 60, children Jackson, 18, Redick, 16, George, 15, Needham, 12, and Martha, 10, and niece Hatta, 4. On 28 June 1898, Reddick D. Dew, 30, of Wilmington, whose parents lived in Wilson, married Addie J. Cash, 30, daughter of John and Martha Cash of Wilmington. In the 1900 census of Wilmington, New Hanover County: at 718 Orange Street, widow Marthia Cash, 59, daughter Addie Diew, 33, and son-in-law Reddick Diew, a barber. In the 1910 census of Wilmington, New Hanover County: at 718 Orange Avenue, South Carolina-born widow A. Martha Cash, 68, a lace stretcher (she reported only one of nine children); son-in-law D. Reddick Diew, 40, barber; and daughter J. Addie, 39; plus three lodgers. In the 1915 city directory of Wilmington, North Carolina: Redick D Dew, barber, 6 S. 2nd. In the 1920 census of Wilmington, New Hanover County: at 718 Orange Avenue, barber Redick Diew, 51, wife Addie, 52, and mother-in-law Martha Cash, 82. Probably, in the 1928 city directory of Goldsboro, North Carolina: Redick D Dew, barber, 603 W. Pine. Redick Diew died 6 August 1933 in Wilson. Per his death certificate, he was 3 August 1868 in Wilson County to Alfred and Susan Diew; was a barber; was a widower; and resided at 1108 Wainwright Avenue. Eula Locus of the home was informant. John and Annie Thomas family? Mattie Thomas was the informant for the death certificates of Nannie Thomas Miller and David Thomas. She indicated that both were born in Wilson, North Carolina, to John and Annie Thomas. Census records, however, paint an unclear picture of the Thomas’ familial relationships and birthplaces. In the 1900 census of Asheville, Buncombe County: widowed washerwoman Annie Thomas, 55, children Cora Coldwell, 20, and Nannie, 19, Maggie, 15, John, 10, and Sallie, 9, daughter-in-law Mary, 18, and grandson David, 1. All listed as South Carolina-born, except Maggie, John, Sallie and David, born in North Carolina. In the 1910 census of Asheville, Buncombe County: at 6 Brick Street, David Thomas, 27, wife Mary, 26, and daughters Mattie, 9, Annie B., 7, Madlone, 2, and Nannie M., 5 months. At 7 Brick Street, Annie Thomas, 63, and children John, 20, and Sallie Thomas, 17, and Nannie Grant, 24. All were listed as South Carolina-born. 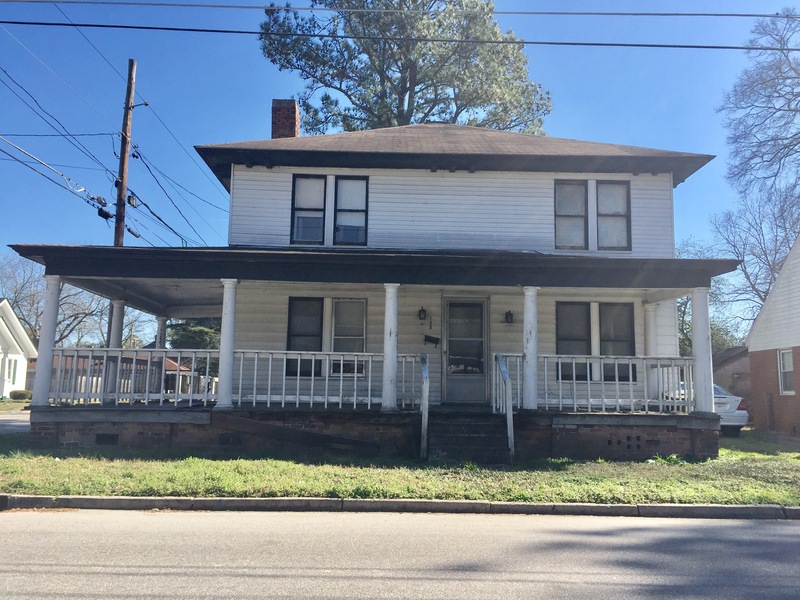 In the 1920 census of Asheville, Buncombe County: at 54 Davidson Street, Annie Thomas, 73, sons David, 36, and John, 25, both bakers; daughter Minnie G., 29, a cook; and grandchildren Mattie, 19, a maid, Annie Belle, 17, Madalon, 11, Eddie, 5, John, 6, David, 21, a transfer company teamster, and Sallie, 7; and daughter-in-law Hattie, 23, plus a lodger. The birth place of Annie, David and Minnie was listed as South Carolina. In the 1940 census of Asheville, Buncombe County: at 139 Eagle Street, Mattie Thomas, 35, a hotel maid; brother David, 40, a wholesale produce delivery helper; and three lodgers.